Nikkei Telecom 21 (日経テレコン) is a reputable newspaper database in business and economics from Japan. The University Library has started a subscription to this resource from 1st January 2016. This is an essential resource for various kinds of studies such as economics, politics, sociology and Japanese language. It gives access to a great number of Nikkei newspaper articles from 1975 to the present. The database also contains hundreds of daily news articles in English published by Nikkei Inc. and Dow Jones & Company Inc. An English Archive Search is available for Nikkei Asian Review and major Nikkei newspaper articles. 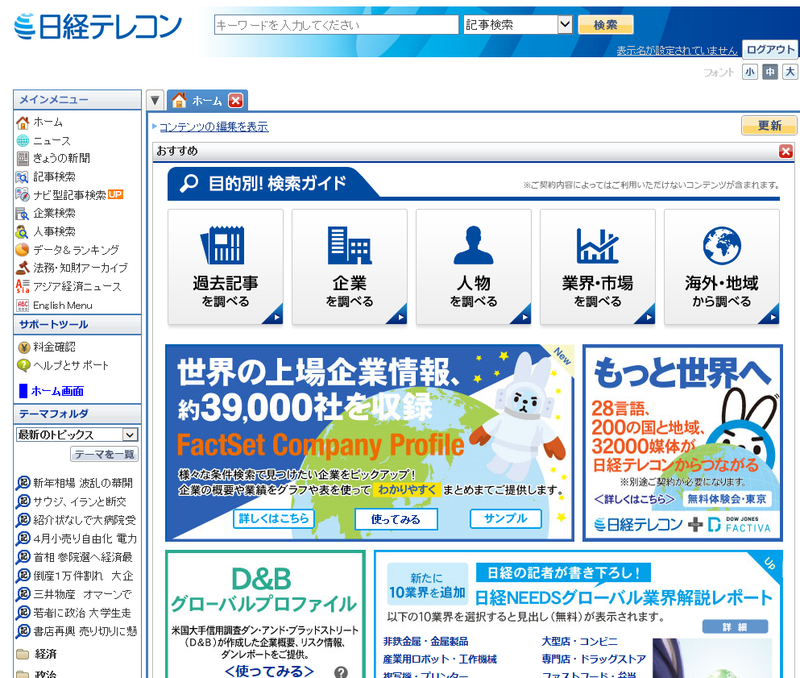 In addition to news articles, Nikkei Telecom offers various aspects of business information related to Japanese economy, such as profile information of major Japanese companies, personnel information of executives, Nikkei’s survey data, macroeconomic statistics, etc. Staff and students can now access this resource on the University network via http://t21ipau.nikkei.co.jp/ipauth/auth/auth?sid=1 . This resource will soon be added to the Database list and the web link be configured so that it can be accessed on and off campus via EASE login. A simple user guide is available from here. A full guide can be downloaded from https://www.nikkeieu.com/telecom/en/userguide.pdf.